Don't judge me by my finger rolls! This package includes one grey child size peruke wig, for the colonial elder in your family. With it's traditional sleek top and rolled curls above the ears, this wig will lend an authoritarian air to any colonial costume. 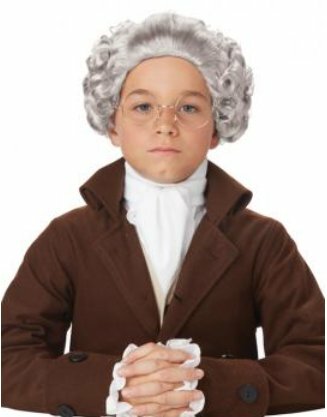 In child size to fit the smaller heads, team it with a Benjamin Franklin or Colonial Boy costume to really set the scene.